Credit: NASA/GSFC. Download this image (JPG, 3.9 MB). 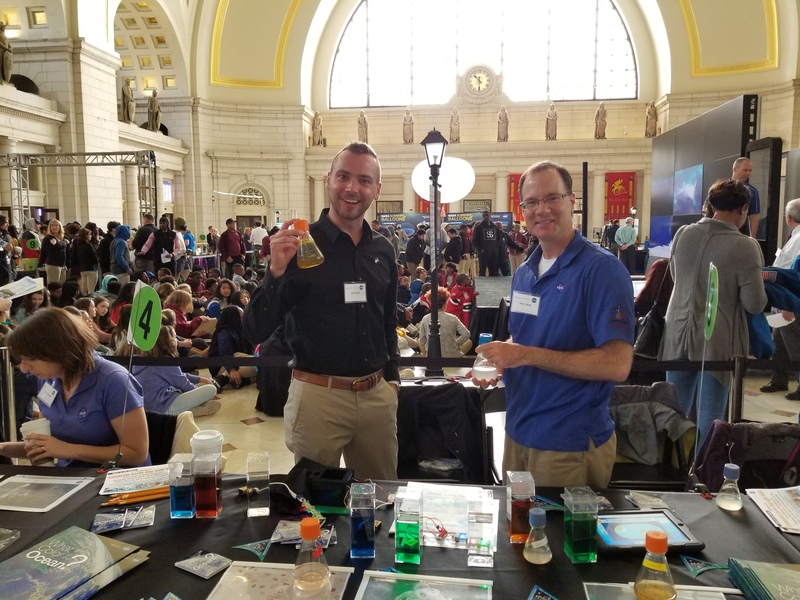 [19-Apr-18] Joel Scott, scientific programmer (left), and Gary Davis, spacecraft systems engineer (right), showcase cultures of phytoplankton for NASA Earth Day Celebration at Union Station in Washington D.C. The annual event features activities and inforamation about NASA Earth Science, as well as a series of scheduled hyperwall talks. At the "Ocean Life from Space" booth, students and the public learned more about phytoplankton and the PACE mission. Visitors were also introduced to Phytopia, an online interactive tool that explores the world of phytoplankton.